Reputation, blockbusting and The Invasion (1968) | Randomwhoness: a Doctor Who blog by Johnny Spandrell. Sampling stories in random order. We watch The Invasion now in a post-Web of Fear world. We’ve long known that this iconic Cyber adventure was spawned because Doctor Who‘s production team had impressed themselves with the one with the Yetis in the underground. But now we’ve got 5/6ths of The Web of Fear to look at, we can see the similarities writ large. In The Invasion‘s later instalments, Cybermen stalk London’s underground sewer system (it’s lucky they don’t have Cyber noses). But watching those scenes now, it feels more like a retread than it did before we got those missing eps back. Monsters, tunnels, Camfield. If it’s working, don’t change it. It could have felt even more like The Web of Fear with Cybermen, if that story’s supporting characters Professor and Ann Travers had made an appearance as originally planned. Apparently this would have meant more payment to Yeti writers Mervyn Haisman and Henry Lincoln, but relations between them and the production team might have been a bit frosty since their last story had an episode cut off it for being a bit dull. The Professor (that lazy use of that title again) is halfheartedly replaced by another. But Ann, although not directly replaced, has made her presence felt. We can see now from Web that Ann developed a companion-like rapport with the Doctor. It’s not too hard to believe she’s an influence on subsequent brainiac companions; pocket rocket Zoe who features here and more overtly Liz Shaw who’ll take over next season. But there’s plenty of other stories which The Invasion steals from. It’s not difficult to see the influence of that other recently returned gem, The Enemy of the World. They both seem to be desperately tying to break away from formulaic ‘monsters attack isolated humans’ stories around them. Both have gunfights, helicopters and hop confidently from location to location. And if we think of Enemy as Who‘s attempt at a James Bond film, it’s got nothing on The Invasion which basically has a Bond villain at its core in slimy Tobias Vaughn (a powerhouse performance from Kevin Stoney). The Invasion is Vaughn’s show. He’s all style in his Nehru jacket, striding up and down his posh London office (which in a nifty cost saving measure is the same is the same set as his posh country office). Stoney plays him with silky politeness, punctuated occasionally with sudden outbursts of fury. He only needs to be stroking a fluffy white cat to complete the picture. ‘No, Doctor Who, I expect you to die!’ he really should have got to say. He, of course, has an incompetent henchman, the hapless Packer. Or Packaaah! as Vaughn expansively calls him (this has become a common refrain around Chez Spandrell; ‘Packaaah, take out the garbage will you?’). Packaaah, as played by Who stalwart Peter Halliday, is the picture of floppy fringed dimness. He’s not helped by a communications device strapped to his wrist which has to be constantly repositioned from mouth to ear, making an already twitchy character seem as if he’s developed an inconvenient new spasm. Vaughn’s made his money in electronics. His company, International Electromatics produces ubiquitous consumer gadgets which are in every home and business around the world. Back in 1993 when this story was released on VHS, this all seemed a bit far fetched. But as I write this on my iPad before checking my iPhone, it now seems prescient. Steve Jobs as a ranting, tyrannical magnate, hurling insults at his subordinates and hypnotizing people via their handheld devices until they become passive, obedient cult followers? I can see it. The Cybermen are mere guest stars in Vaughn’s story. Think of this as their Revelation of the Daleks, where the monsters are kept in the background and the chief villain gets the limelight. They don’t even turn up until the cliffhanger of Episode 4, and when they do, they are kept as a mysterious presence lurking in the background. We get no scene of the Doctor confronting them. No scenes of them discussing their plans. Indeed, they get very few lines at all (Although there is the Cyber Planner, a free standing talking whatsit that attentive viewers might have remembered from The Wheel in Space. This collection of wires and tubes is kept in a cupboard by Vaughn and is wheeled out from time to time to discuss plot details.). This was the Cybermen’s fifth story in just over two years, so a little variation from their standard modus operandi was probably due. The major variation was the addition of a human villain to complement those Cybermen. This is an approach trialled in The Tomb of the Cybermen, but in that story, the human bad guys were in addition to, not in partnership with the monsters. So it’s really Vaughn and The Invasion that set the template for nearly all Cybermen stories to come. It’s not until Closing Time that the Cybermen go solo again. And you can see why; the Cybermen are tin cans. It’s hard to get some drama going with talking tin cans, so you need a human nasty to chew some scenery. The other story it harkens back to is The Dalek Invasion of Earth (our very first random one year ago!). The Daleks invaded London and marched across Westminster Bridge. 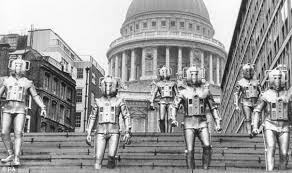 The Cybermen invade London and walk down the steps St. Paul’s cathedral. Well, you go somewhere, you see the sights, right? They’re clip show moments. But more than that, these two stories are sixties blockbusters. Lots of action sequences, lots of location filming and the sense that all stops are really being pulled out. You only have to look at this stories around The Invasion to see that this is story that got all the attention. I wonder if we had The Invasion‘s two missing episodes back would this appear even more of an epic, what with Episode 1’s escape from the IE compound, and Episode 4’s rescue of Zoe and Isobel by helicopter. My point? That The Invasion is often identified as a template for the Doctor Who stories which came after it. But just as important as its influence on the future, is its drawing on the past. But to be fair, it’s influence on future Who still hasn’t expired. Dark Water/Death in Heaven after all pays homage to it by repeating the St Paul’s steps sequence. It’s a sign that we’ll still be talking about The Invasion for some time yet. LINK to… See last time. NEXT TIME… Well, this is gay! Time to get crabby with The Macra Terror. I don’t think Kellman, Ringway or Lytton are really Cyber-partners in the way Vaughn is. Even the Master in Five Doctors only is on sufferance and bumps them off at the first opportunity. In the New Series they’re operating sans villain as often as not. It’s not really till Death in Heaven that they’re once again used purely as muscle for a villain’s scheme. You’re right, of course. There are different levels of Cyber associates. And some stories’ associates are more collaborators than others. What I was getting at was the need to include any humanoid sub villain at all, be they partners or hangers on. Stories like The Wheel in Space and Closing Time where they are let out without any humanoid support act are rare. It’s almost like they’re not trusted to carry a whole story by themselves. But basically, I’m chuffed to have my first comment on the blog so thanks! So I’ll agree with anything you say.